The SmugMug Export Plugin for Adobe Lightroom enables you to export photos and videos from Adobe Lightroom directly to your SmugMug account, manage online albums, and synchronize your entire album hierarchy via Lightroom's Publish Services. You may use the unregistered (free) version at no charge for a limited time (10 days), after which you have to register the plugin in order to continue using it. Other than that, the demo version is a full-featured product and has no other restrictions. Several compatibility changes that follow the recent update of SmugMug's API. Completely redesigned the automatic update mechansim. Export Dialog: implemented a new option for reloading cached galleries in a single folder only. Updated the authentication mechanism for compliance with the new API. Implemented an option for manual authentication for situations when the web browser is unable to pass control back to Lightroom. This option also provides backward compatibility with Lightroom 2 and 3. Fixed the issue with uploading a single photo to multiple galleries. Export Dialog: fixed the issue with the gallery menu staying grayed out. Publish Service: Users are prompted to re-authenticate less often. Export Dialog: fixed a rare issue with retrieving galleries from the server. Publish Service: fixed the issue with creating galleries. SmugMug API: eliminated the use of deprecated data fields. Export Dialog: implemented filtering by album date. Associate Images: Fixed the issue with recognizing only 100 images in an album. Fixed: photos removed from published collections retain SmugMug metadata. Publish Service: Fixed the "attempt to index local 'dialog'" error when creating folders. Fixed error 409 when trying to create a new gallery with a URL name which already exists. Export Dialog: Fixed several layout issues specific to Mac OS. Associate Images: Fixed the assertion error when images at SmugMug have no capture date information. Fixed the issue with republishing photos that were originally uploaded using an older version of the plugin. Fixed the "The requested resource no longer exists on the server" error when re-publishing albums that were deleted at SmugMug through the web browser. Implemented better sanitizing of gallery's Custom URL to suppress special characters. Fixed: special characters in the account name may cause issues with folder operations. Version 2.x is based on the new SmugMug API, which matches the hierarchial concept of the "New SmugMug" and gives more control over galleries and media files. Publish Service: Now you can use folders and sub-folders of unlimited nesting depth to organize your photo galleries. Export: The album list menu has been replaced with two drop-down menus. One contains a hierarchical list of all folders; the other shows all galleries within the selected folder. Publish Service: Reclaim Photos - this feature enables you to download your photos hosted at SmugMug back to your computer and rebuild your publish service. The Gallery Properties dialog has been redesigned to match the dialog's layout at SmugMug. Fixed SmugMug API compatibility issue - "Server returned error code 17 / invalid method". Fixed the issue with creating albums when the first letter of the album name is in lower case. Publish Service: Now you can assign Featured Images for your galleries. Fixed the "system error (AlbumID) (smugmug.albums.getInfo)" error when the plugin encounters a gallery that has been removed from SmugMug. Fixed the issue with renaming galleries. Fixed: "attempt to index field '?'" when starting the plugin for the first time. Fixed: a minor layout issue in the "Publish Service Extras" section (Mac OS). Improved validation of album names as per http://www.dgrin.com/showthread.php?t=239616. 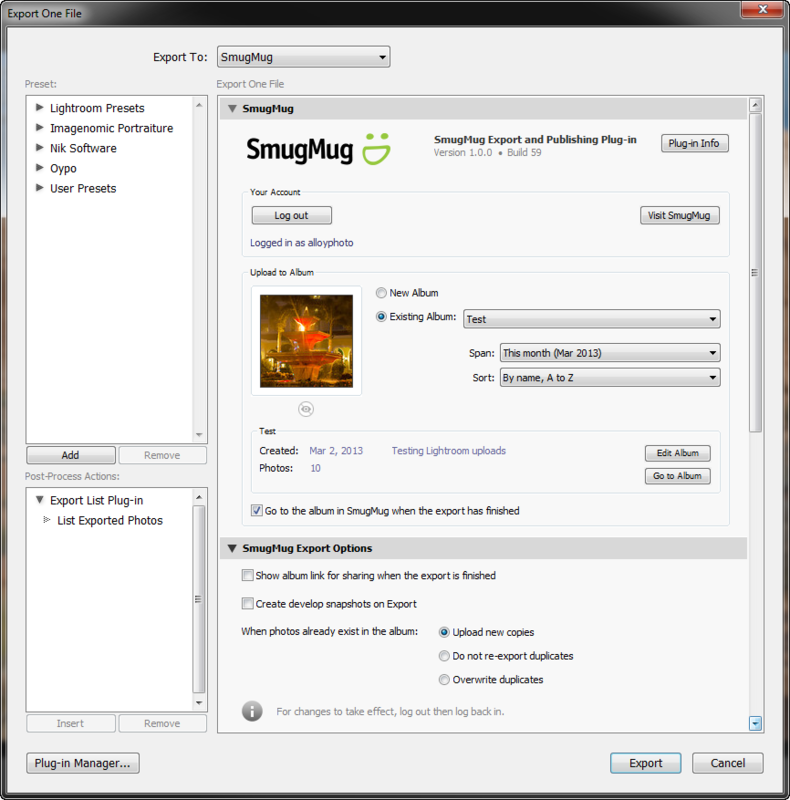 Fixed: In some rare scenarios the plugin may lose session with SmugMug. Fixed: "attempt to concatenate a table value" error in the Export Dialog when creating new albums. Fixed the "attempt to call method actionButtonIntercepted" error when creating new albums. Fixed the issue with deleting photos and albums from the publish service. Fixed the "? :0: attempt to concatenate a table value" during the activation. Improved the handling of expired authorization tokens. Added support for the "new" SmugMug. Now you can password-protect your albums. Added the ability to customize various advanced options for your albums. Comment timestamps are calculated correctly based on your local timezone. Now the "Associate Images" feature with the "Capture Time" option works correctly. Publish Service: Fixed the issue with custom image settings not getting applied to newly created albums. Fixed: By default, the authorization step requests a level of permissions that is insufficient to create new albums at SmugMug. Implemented validation for the current permission level at SmugMug. Publish Service: Fixed the issue with creating new albums. Fixed an issue with autenticating the user in some situations. 1. If you accidently delete a photo on Smugmug, will the Publish Service correctly recognize it as missing and want to republish it? 2. If the publish or export service is set to "sync" at a folder level, will all levels (up to 5 now I think) be kept in sync with the file structure at Smugmug? 1. The “Check Photos” feature will identify deleted photos and mark original photos in Lightroom’s publish service for republishing. 2. Selecting an album at the higher level will include the underlying albums in the publish operation. Keep in mind, you can also select multiple albums individually using Shift+Click and Ctrl+Click. I've been trying to upgrade to 1.3.1 through Lightroom because it says there's an update available but I keep getting this error code, "bad argument #1 to 'ipairs' (table expected, got nil)". Please help!! I just purchased this plug-in, but the registration key I was sent by Adobe Exchange Support doesn't work. It is as follows: SMG01-AMY6H-UMI7K-HA131-EGXNS. I just keep getting an error message that it can't be activated at this time, check your name and key. I suspect you are typing in your serial number by hand and you are making typical typing mistakes, i.e. “1” instead of “I” or “0” instead of “O”. Please use copy-and-paste to avoid typing errors.